People are on edge after a police chase ended in a crash in Roslindale. 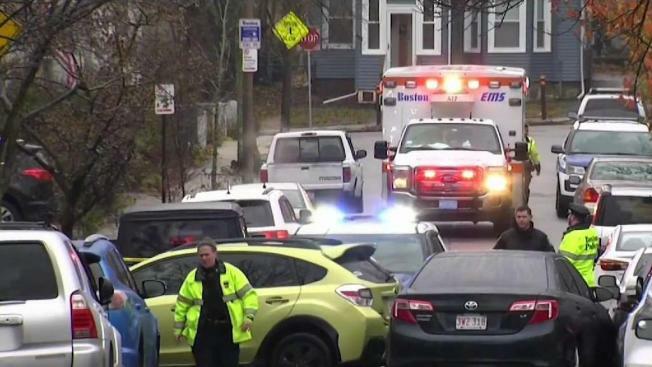 A police chase that began Tuesday afternoon in Boston's West Roxbury neighborhood ended with the arrest of a man in nearby Roslindale. Authorities said an officer first approached a man inside a black Mercedes, illegally parked in front of the entrance of Roche Bros. on Centre Street, and told him that he needed to move. When the driver allegedly took off erratically, police began chasing him. Allie Jones told NBC10 Boston she was just leaving her job as a dog walker on Bexley Street in the city's Roslindale neighborhood when the man in the Mercedes smashed into her green sedan. "I was just backing out, I heard the horn and I slammed on my brakes, and then all I saw was the car trying to get around me and then the cops come yelling, 'put your hands up, put your hands up,'" Jones recalled. Police were eventually able to get the suspect, later identified as 57-year-old Michael Robicheau of West Roxbury, out of the car. Authorities said a shotgun was recovered inside the vehicle. "I was very scared. I was petrified, to be honest," Jones said. "If you see like 5 policemen running towards a car that's in front of you, with their guns drawn, it's going to scare anyone." A total of three vehicles were struck during the chaos.